At Nutricia, the maker of Neocate, we believe in the power of nutrition to make a positive and proven difference to health. Every day we are inspired by our purpose: to pioneer nutritional discoveries that help people of every age live longer, healthier lives. Explore Neocate's advanced line of evidence-backed hypoallergenic products that safely nourish patients with food allergy-related conditions from birth through school age and beyond. Neocate® Syneo® Infant is specially formulated for the dietary management of infants with cow milk allergy (CMA), multiple food allergies (MFA) and related GI and allergic conditions, including food protein-induced enterocolitis syndrome (FPIES), eosinophilic esophagitis (EoE) and gastroesophageal reflux (GER). Infants with a post-pyloric feeding tube, which bypasses the stomach and empties into the small intestine. Infants with a central venous catheter (CVC). Infants with short bowel syndrome (SBS), unless a risk and benefit analysis is completed by a healthcare professional and the infant is monitored. Neocate® Syneo® Infant is a specially formulated medical food and should only be used under medical supervision. Neocate® Syneo® Infant is available to healthcare professionals to sample. Contact your Nutricia sales representative to request samples to be sent free of charge to your practice. Neocate products are WIC* eligible in all States. Reimbursement codes have been submitted by Nutricia North America to US data warehouses based on the format established by the data warehouses. These codes are not NDC numbers. Corn Syrup Solids (51%), Refined Vegetable Oil (Medium Chain Triglycerides (8%), High Oleic Sunflower Oil (6%), Sunflower Oil (4%), Canola Oil (4%)), Fructooligosaccharides (Oligofructose (4%), Inulin (0.5%)), less than 2% of each of the following:Dipotassium Phosphate, Tricalcium Phosphate, Calcium Carbonate, Calcium Glycerophosphate, L-Arginine L-Aspartate, Calcium Phosphate Dibasic, L-Leucine, L-Lysine Acetate, Tripotassium Citrate, L-Glutamine, L-Proline, L-Valine, Citric Acid Esters of Mono- and Diglycerides (CITREM), Glycine, L-Isoleucine, L-Threonine, L-Phenylalanine, L-Tyrosine, L-Serine, L-Histidine, L-Alanine, Sodium Chloride, L-Cystine, L-Tryptophan, Magnesium Chloride, Choline Bitartrate, L-Methionine, Tricalcium Citrate, Magnesium L-Aspartate, M. alpina Oil*, C. cohnii Oil**, M-Inositol, L-Ascorbic Acid, Taurine, Ferrous Sulfate, Zinc Sulfate, L-Carnitine, Uridine 5’-Monophosphate Disodium Salt, Cytidine 5’-Monophosphate, Niacinamide, Inosine 5’-Monophosphate Disodium Salt, Adenosine 5’-Monophosphate, Calcium D-Pantothenate, Guanosine 5’-Monophosphate Disodium Salt, DL-alpha Tocopheryl Acetate, Bifidobacterium breve M-16V, Ascorbyl Palmitate, Manganese Sulfate, Thiamin Chloride Hydrochloride, Pyridoxine Hydrochloride, Cupric Sulfate, Riboflavin, Vitamin A Acetate, DL-alpha Tocopherol, Potassium Iodide, Mixed Tocopherols, Folic Acid, Chromium Chloride, Phylloquinone, Sodium Selenite, Sodium Molybdate, D-Biotin, Vitamin D3, Cyanocobalamin. Neocate® Syneo® Infant can be given orally or by feeding tube. Not for parenteral use. Neocate Syneo Infant is not recommended for use in infants with a central venous catheter or post-pyloric feeding tube unless directed or supervised by a healthcare professional. Tube feeding hang time: Nutricia recommends formula can be safely kept at room temperature for up to 4 hours, at which time unused formula should be discarded. All scoops should be measured and unpacked. Use a scale that measures in grams for the most accurate results. Household measures are not recommended for measuring powdered Nutricia products. The first and only hypoallergenic infant formula to contain a unique synbiotic blend of prebiotics and probiotics, specifically designed to support food-allergic infants. 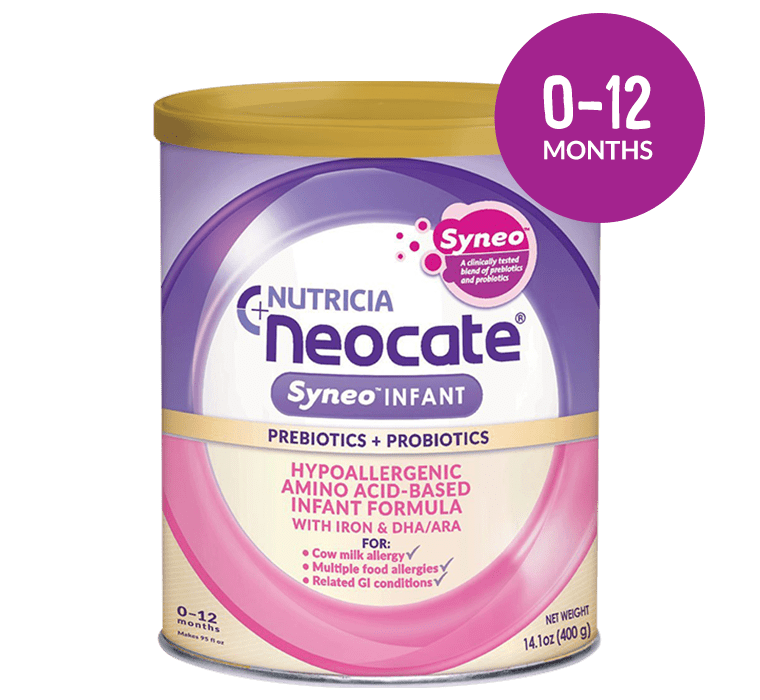 Neocate® Syneo® Infant is specially formulated for the dietary management of infants with cow milk allergy, multiple food allergies, and related GI and allergic conditions, including food protein-induced enterocolitis syndrome (FPIES), eosinophilic esophagitis (EoE) and gastroesophageal reflux (GER). Clinically shown to address the gut dysbiosis seen in food-allergic infants, this innovative formula contains a probiotic originally found in the microbiota of a healthy infant and a prebiotic blend modeled after the oligosaccharides in human milk. Neocate Syneo Infant is backed by 3 clinical trials to be hypoallergenic, support growth, and to help balance the gut microbiota of food-allergic infants to be closer to that of healthy, breastfed infants. Purposes:  To assess the hypoallergenicity of Neocate with synbiotics in IgE-mediated cow milk allergy,  To evaluate growth outcomes and formula tolerance in healthy infants fed Neocate with synbiotics. Methodology:  Thirty infants & children with IgE-mediated cow milk allergy used Neocate with synbiotics followed by a double-blind, placebo-controlled food challenge. Healthy infants (0-15 days) were randomly assigned to receive a control amino acid-based formula or Neocate with synbiotics for 16 weeks. (n=115) Results/Conclusion:  This study demonstrated that Neocate with synbiotics is safe, well-tolerated and hypoallergenic according to American Academy of Pediatrics guidelines. This study demonstrated that Neocate with synbiotics is safe, well tolerated and promotes normal growth when fed to healthy infants. Purpose: To evaluate growth outcomes and formula tolerance in infants with IgE- or non-IgE-mediated cow milk allergy fed Neocate with synbiotics. Methodology: Infants with CMA were randomly assigned to receive Neocate with synbiotics or a control formula (Neocate® Infant DHA/ARA) for 16 weeks. (n=110) Results/Conclusion: This study demonstrated that Neocate with synbiotics is safe and promotes normal growth in infants with cow milk allergy. Purpose: To determine whether Neocate® Syneo® Infant will improve the developing gut microbiota in infant subjects with cow milk allergy relative to a standard amino acid-based formula and healthy, breastfed infants. Methodology: Infants with non-IgE-mediated cow milk allergy were randomized to receive a control amino acid-based formula or Neocate Syneo Infant for 8 weeks. A healthy breastfed reference group was also included. Results/Conclusion: This study demonstrated that Neocate Syneo Infant helps balance the gut microbiota of infants with cow milk allergy, bringing it closer to that seen in age-matched, healthy breastfed infants (figures available). Over 150 publications and counting support the use of Neocate for a wide variety of conditions and ages. Of those, there are more than 60 publications on the clinical use of Neocate formulas for the dietary management of cow milk allergy, multiple food allergies and related gastrointestinal and allergic conditions, including eosinophilic esophagitis, short bowel syndrome, and gastroesophageal reflux. There are also many case studies that discuss the successful use of Neocate in these and other conditions, research studies that demonstrate the safe use of Neocate by otherwise healthy infants, and preclinical studies on Neocate. Harvey BM, Langford JE, Harthoorn LF, et al. Effects on growth and tolerance and hypoallergenicity of an amino acid–based formula with synbiotics. Pediatr Res. 2014;75:343-51. Burks AW, Harthoorn LF, van Ampting MTJ, et al. Synbiotics-supplemented amino acid-based formula supports adequate growth in cow's milk allergic infants. Pediatr Allergy Immunol. 2015;26:316-22. Candy DCA, Van Ampting MTJ, Oude Nijhuis MM, et al. A synbiotic-containing amino-acid-based formula improves gut microbiota in non-IgE-mediated allergic infants. Pediatr Res. 2018;83:677-86. For patient safety, Nutricia directs parents and caregivers requesting specialized information, such as mixing instructions at non-standard dilutions, to their healthcare teams. Neocate should always be used under medical supervision. 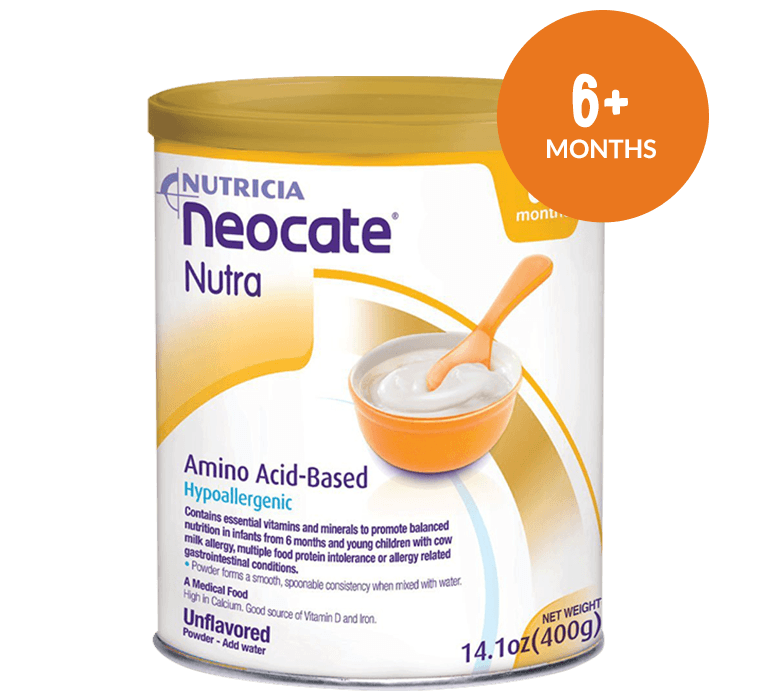 Neocate® Infant is a hypoallergenic amino acid-based formula,1 designed for food-allergic infants. Neocate® Infant is specially formulated for the dietary management of infants with cow milk allergy (CMA), multiple food allergies (MFA) and related GI and allergic conditions, including food protein-induced enterocolitis syndrome (FPIES), eosinophilic esophagitis (EoE), short bowel syndrome (SBS), malabsorption and gastroesophageal reflux (GER). Neocate® Infant DHA/ARA is available to healthcare professionals to sample. Contact your Nutricia sales representative to request samples to be sent free of charge to your practice. *WIC is a registered service mark of the U.S. Department of Agriculture for USDA's Special Supplemental Nutrition Program for Women, Infants and Children. WIC eligible means that a product has been approved at the Federal level and, therefore, may be included on a State agency's authorized food list if the State agency so chooses. Each WIC State agency determines its own allowed formula list. Contact your State WIC office to determine the availability of a specific WIC eligible Nutricia product in your area. 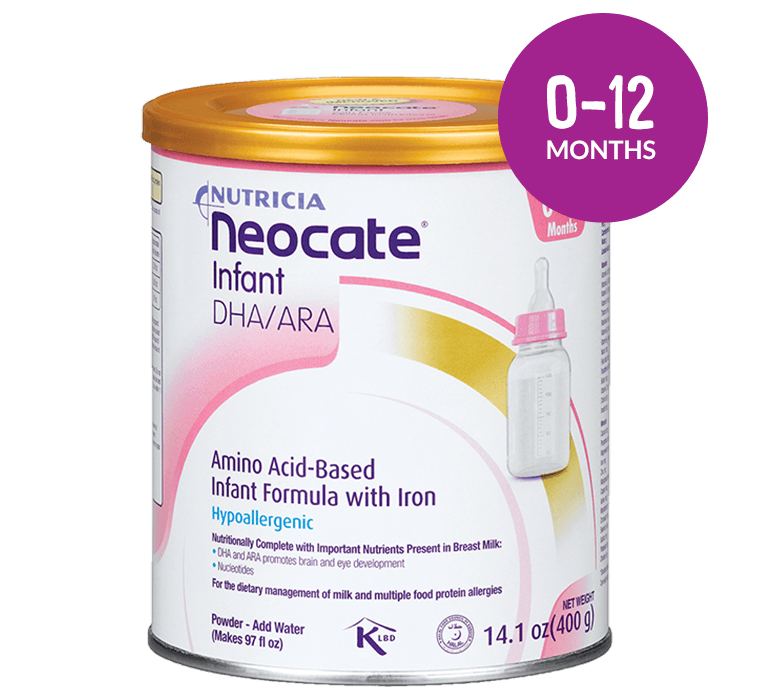 Neocate® Infant DHA/ARA can be given orally or by feeding tube. Not for parenteral use. Sampson HA, James JM, Bernhisel-Broadbent J. Safety of an amino acid-derived infant formula in children allergic to cow milk. Pediatrics. 1992;90:463-5. For oral use only; not intended for bottle or tube feeding. Neocate® Nutra is available to healthcare professionals to sample in single-serving packets. Contact your Nutricia sales representative to request samples to be sent free of charge to your practice. WIC is a registered service mark of the U.S. Department of Agriculture for USDA's Special Supplemental Nutrition Program for Women, Infants and Children. WIC eligible means that a product has been approved at the Federal level and, therefore, may be included on a State agency's authorized food list if the State agency so chooses. Each WIC State agency determines its own allowed formula list. Contact your State WIC office to determine the availability of a specific WIC eligible Nutricia product in your area. 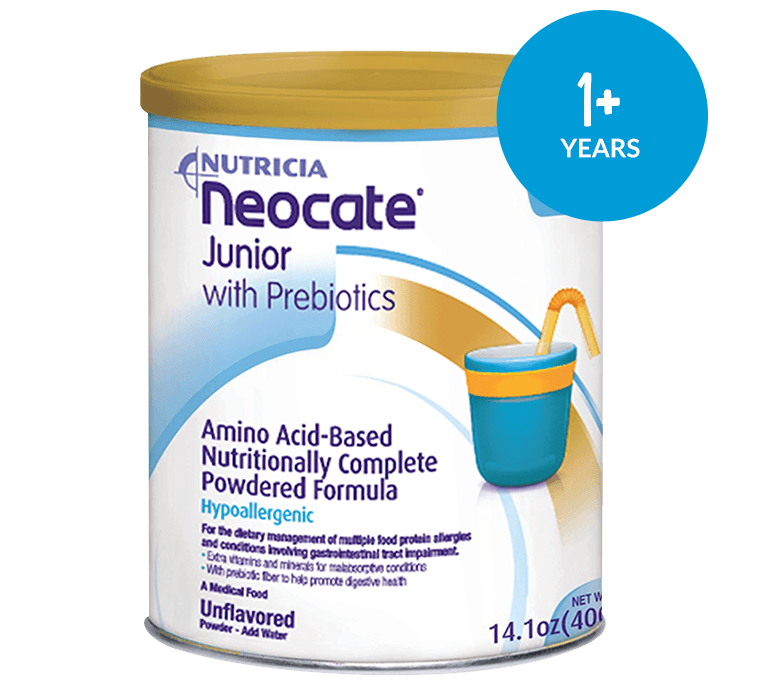 Neocate® Junior is a hypoallergenic formula specifically designed to address the growing nutritional needs of toddlers and older children. It is the first and only hypoallergenic formula with prebiotic fiber* to help support digestive health.1-4 More than 55% of children do not meet their recommended fiber needs.5,6 To meet a variety of taste preferences, it comes in five flavors: Vanilla, Strawberry, Chocolate, Tropical and Unflavored*. Neocate® Junior is specially formulated for the dietary management of children with cow milk allergy (CMA), multiple food allergies (MFA) and related GI and allergic conditions, including eosinophilic esophagitis (EoE), food protein-induced enterocolitis syndrome (FPIES), gastroesophageal reflux (GER), short bowel syndrome (SBS), and malabsorption. †Derived from osmolality at standard dilution: assumes direct linear relationship with formula concentration. Neocate® Junior is available to healthcare professionals to sample. Contact your Nutricia sales representative to request samples to be sent free of charge to your practice. *Nutricia North America does not represent these codes to be National Drug Codes (NDCs). NDC-format codes are product codes adjusted according to standard industry practice to meet the format requirements of pharmacy and health insurance systems. †WIC is a registered service mark of the U.S. Department of Agriculture for USDA's Special Supplemental Nutrition Program for Women, Infants and Children. WIC eligible means that a product has been approved at the Federal level and, therefore, may be included on a State agency's authorized food list if the State agency so chooses. Each WIC State agency determines its own allowed formula list. Contact your State WIC office to determine the availability of a specific WIC eligible Nutricia product in your area. Corn Syrup Solids, Refined Vegetable Oil (Medium Chain Triglycerides (Palm Kernel and/or Coconut Oil), High Oleic Sunflower Oil, Sunflower Oil, Canola Oil), L-Serine, and less than 2% of each of the following: L-Glutamine, Glycine, L-Alanine, L-Leucine, L-Lysine Acetate, L-Threonine, L-Tyrosine, Dipotassium Phosphate, Citric Acid Esters of Mono- and Diglycerides (CITREM), L-Valine, Tricalcium Phosphate, Maltodextrin, L-Isoleucine, Tripotassium Citrate, Trisodium Citrate, Calcium Carbonate, L-Proline, L-Cystine, L-Histidine, L-Phenylalanine, Choline Bitartrate, Magnesium Hydrogen Phosphate, L-Methionine, L-Arginine, Sodium Chloride, Calcium Chloride, L-Tryptophan, Magnesium Chloride, M-Inositol, L-Ascorbic Acid, Sunflower Lecithin, Taurine, Ferrous Sulfate, L-Carnitine, Zinc Sulfate, DL-Alpha Tocopheryl Acetate, Ascorbyl Palmitate, Niacinamide, Calcium D-Pantothenate, Manganese Sulfate, Cupric Sulfate, Riboflavin, Thiamin Chloride Hydrochloride, Pyridoxine Hydrochloride, Vitamin A Acetate, Folic Acid, Potassium Iodide, Chromium Chloride, Sodium Molybdate, Sodium Selenite, Phylloquinone, D-Biotin, Vitamin D3, Cyanocobalamin. Corn Syrup Solids, Refined Vegetable Oil (Medium Chain Triglycerides (Palm Kernel and/or Coconut Oil), High Oleic Sunflower Oil, Sunflower Oil, Canola Oil), L-Serine, and less than 2% of each of the following: L-Glutamine, Glycine, L-Alanine, L-Leucine, L-Lysine Acetate, L-Threonine, Artificial Flavor, L-Tyrosine, Dipotassium Phosphate, Fructooligosaccharides, Inulin, L-Valine, Citric Acid Esters of Mono- and Diglycerides (CITREM), Tricalcium Phosphate, Maltodextrin, L-Isoleucine, Tripotassium Citrate, Trisodium Citrate, Calcium Carbonate, L-Proline, L-Cystine, L-Histidine, L-Phenylalanine, Choline Bitartrate, Magnesium Hydrogen Phosphate, L-Methionine, L-Arginine, Sodium Chloride, Calcium Chloride, L-Tryptophan, Magnesium Chloride, M-Inositol, L-Ascorbic Acid, Sunflower Lecithin, Sucralose, Taurine, Ferrous Sulfate, L-Carnitine, Zinc Sulfate, DL-Alpha Tocopheryl Acetate, Ascorbyl Palmitate, Niacinamide, Calcium D-Pantothenate, Manganese Sulfate, Cupric Sulfate, Riboflavin, Thiamin Chloride Hydrochloride, Pyridoxine Hydrochloride, Vitamin A Acetate, Folic Acid, Potassium Iodide, Chromium Chloride, Sodium Molybdate, Sodium Selenite, Phylloquinone, D-Biotin, Vitamin D3, Cyanocobalamin. For use only under medical supervision. Suitable for use as a sole source of nutrition, for children over one year of age. Suggested intake to be determined by a healthcare professional and is dependent on the age, body weight and medical condition of the patient. For oral and tube feeding only; not for parenteral use. Do not boil formula. Do not use a microwave oven to prepare or warm formula. Storage: Formula prepared in advance should be stored in a refrigerator at 35-40°F (2-4°C) and used within 24 hours of preparation. Shake or stir Neocate® Junior immediately before use. Store unopened can at room temperature. Do not store at extreme temperatures. Once opened, reseal can and store in a cool, dry place (not in a refrigerator) and use within one month of opening. Over 175 publications and counting support the use of Neocate in a wide variety of conditions and ages. Of those, there are more than 60 publications on the clinical use of Neocate formulas for the dietary management of cow milk allergy, multiple food allergies and related gastrointestinal and allergic conditions, including eosinophilic esophagitis, short bowel syndrome, and gastroesophageal reflux. There are also many case studies that discuss the successful use of Neocate in these and other conditions, and preclinical studies on Neocate. Elia M, Engfer MB, Green CJ, et al. Systematic review and meta-analysis: the clinical and physiological effects of fibre-containing enteral formulae. Aliment Pharmacol Ther. 2008;27:120-45. Cummings JH. Prebiotics and the gut barrier to infection. J Pediatr Gastroenterol Nutr. 2004;39:S555. Brownawell AM, Caers W, Gibson GR, et al. Prebiotics and the health benefits of fiber: current regulatory status, future research, and goals. J Nutr. 2012;142:962-74. Bosscher D, Van Loo J, Franck A. Inulin and oligofructose as prebiotics in the prevention of intestinal infections and diseases. Nutr Res Rev. 2006;19:216-26. Butte NF, Fox MK, Briefel RR, et al. Nutrient intakes of US infants, toddlers, and preschoolers meet or exceed dietary reference intakes. J Am Diet Assoc. 2010;110:S27-37. Hampl JS, Betts NM, Benes BA. The 'age+5' rule: comparisons of dietary fiber intake among 4- to 10-year-old children. J Am Diet Assoc. 1998;98:1418-23. Isolauri E, Sampson HA. Use of an amino acid based formula in the management of cow’s milk allergy and multiple food protein intolerance in children. J Allergy Clin Immunol. 2004;113:S154(518). Berni Canani R, Nocerino R, Frediani T, et al. Amino acid-based formula in cow's milk allergy: long-term effects on body growth and protein metabolism. J Pediatr Gastroenterol Nutr. 2017;64:632-8. Sorensen K, Fry C, Allford A, et al. Longitudinal study shows improved nutrient intakes and growth with an amino acid formula for children ≥1y with cow's milk allergy and related conditions. Poster presented at EAACI Annual Congress. Jun 17-21; Helsinki, Finland. Poster at EAACI Annual Congress. 2017. Food and Nutrition Board, Institute of Medicine; Otten JJ, Hellwig JP, Meyers LD, Eds. Dietary Reference Intakes: The Essential Guide to Nutrient Requirements. Institute of Medicine (IOM) of the National Academies, Washington, DC: National Academies Press; 2006. Institute of Medicine (US) Committee to Review Dietary Reference Intakes for Vitamin D and Calcium; Ross AC, Taylor CL, Yaktine AL, et al, Eds. Dietary reference intakes for calcium and vitamin D. Institute of Medicine (IOM) of the National Academies, Washington, DC: National Academies Press; 2011. Neocate® Splash is the first and only ready-to-feed hypoallergenic formula specifically designed to address the growing nutritional and lifestyle needs of toddlers, older children and teens. Neocate Splash has a similar nutritional composition to Neocate Junior and is ideal for oral and tube feeding. To meet a variety of taste preferences, it comes in four flavors: Orange-Pineapple, Grape, Tropical Fruit and Unflavored. 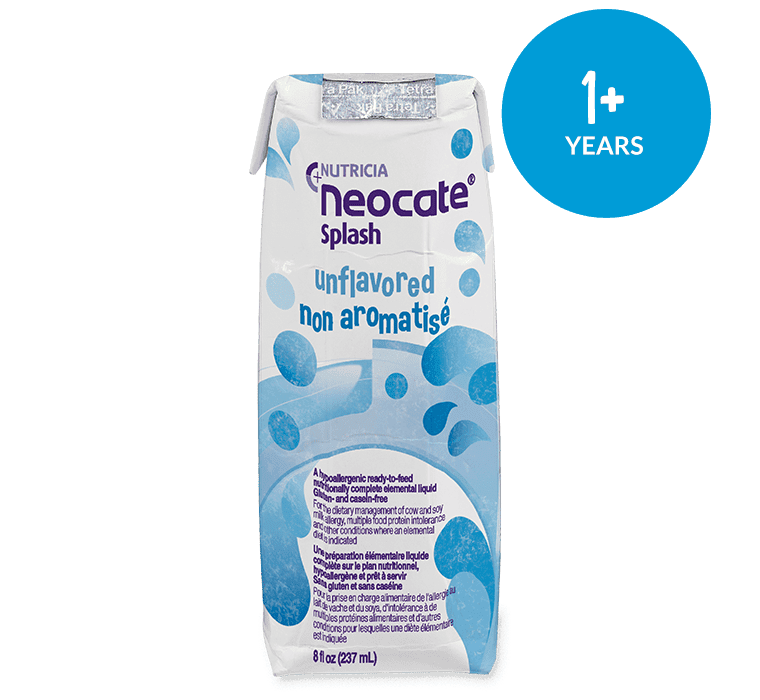 Neocate® Splash is specially formulated for the dietary management of children with cow milk allergy (CMA), multiple food allergies (MFA) and related GI and allergic conditions, including eosinophilic esophagitis (EoE), food protein-induced enterocolitis syndrome (FPIES), short bowel syndrome (SBS), malabsorption and gastroesophageal reflux (GER). Neocate® Splash is available to healthcare professionals to sample. Contact your Nutricia sales representative to request samples to be sent free of charge to your practice. Water (85%), Maltodextrin (6%), Sugar (5%), Refined Vegetable Oils (High Oleic Sunflower Oil (2.3%), Medium Chain Triglycerides (Modified Palm Kernel and/or Coconut Oil) (1.8%), Canola Oil (0.6%)), and less than 2% of each of the following: Calcium Glycerophosphate, L-Arginine, L-Lysine L-Aspartate, Microcrystalline Cellulose, L-Leucine, L-Phenylalanine, Tripotassium Citrate, L-Proline, Diacetyl Tartaric Acid Esters of Mono- and Diglycerides, Mono- and Diglycerides, Trisodium Citrate, L-Valine, Glycine, L-Isoleucine, N-Acetyl-L-Methionine, L-Threonine, L-Histidine, L-Serine, L-Ascorbic Acid, L-Alanine, Malic Acid, Potassium Chloride, Magnesium Acetate, Choline Bitartrate, L-Tryptophan, Calcium Chloride, L-Tyrosine, Cellulose Gum, M-Inositol, L-Cystine, Taurine, Ferrous Sulfate, L-Carnitine, Zinc Sulfate, DL-Alpha Tocopheryl Acetate, Niacinamide, Calcium D-Pantothenate, Manganese Sulfate, Cupric Sulfate, Riboflavin, Thiamin Chloride Hydrochloride, Pyridoxine Hydrochloride, Vitamin A Palmitate, Folic Acid, Potassium Iodide, Chromium Chloride, Sodium Molybdate, Sodium Selenite, Phylloquinone, D-Biotin, Vitamin D3, Cyanocobalamin. Water, Maltodextrin, Sugar, Refined Vegetable Oils (High Oleic Sunflower Oil, Medium Chain Triglycerides (Modified Palm Kernel And/Or Coconut Oil), Canola Oil), and less than 2% of each of the following: Artificial Flavors, Calcium Glycerophosphate, Malic Acid, L-Arginine, L-Lysine L-Aspartate, Microcrystalline Cellulose, L-Leucine, Tripotassium Citrate, L-Phenylalanine, Diacetyl Tartaric Acid Esters Of Mono- and Diglycerides, Mono- and Diglycerides, Trisodium Citrate, L-Proline, L-Valine, Glycine, L-Isoleucine, N-Acetyl-L-Methionine, L-Threonine, L-Histidine, L-Serine, L-Alanine, Potassium Chloride, Magnesium Acetate, Choline Bitartrate, L-Tryptophan, Calcium Chloride, L-Tyrosine, Cellulose Gum, L-Ascorbic Acid, M-Inositol, L-Cystine, Sucralose, Ferrous Lactate, Taurine, L-Carnitine, Zinc Sulfate, DL-Alpha Tocopheryl Acetate, Niacinamide, Calcium D-Pantothenate, Manganese Sulfate, Sodium Selenite, Cupric Sulfate, Riboflavin, Chromium Chloride, Thiamin Chloride Hydrochloride, Vitamin A Palmitate, Pyridoxine Hydrochloride, Folic Acid, Potassium Iodide, Sodium Molybdate, Phylloquinone, D-Biotin, Vitamin D3, Cyanocobalamin. Water, Maltodextrin, Sugar, Refined Vegetable Oils (High Oleic Sunflower Oil, Medium Chain Triglycerides (Modified Palm Kernel And/Or Coconut Oil), Canola Oil), and less than 2% of each of the following: Artificial Flavor, Malic Acid, Calcium Glycerophosphate, L-Arginine, L-Lysine L-Aspartate, Microcrystalline Cellulose, L-Leucine, Tripotassium Citrate, L-Phenylalanine, Diacetyl Tartaric Acid Esters Of Mono- and Diglycerides, Mono- and Diglycerides, Trisodium Citrate, L-Proline, L-Valine, Glycine, L-Isoleucine, N-Acetyl-L-Methionine, L-Threonine, L-Histidine, L-Serine, L-Alanine, Potassium Chloride, Magnesium Acetate, Choline Bitartrate, L-Tryptophan, Calcium Chloride, L-Tyrosine, Cellulose Gum, L-Ascorbic Acid, M-Inositol, L-Cystine, Acesulfame Potassium, Ferrous Lactate, Taurine, L-Carnitine, Zinc Sulfate, DL-Alpha Tocopheryl Acetate, Niacinamide, Calcium D-Pantothenate, Manganese Sulfate, Sodium Selenite, Cupric Sulfate, Riboflavin, Chromium Chloride, Thiamin Chloride Hydrochloride, Vitamin A Palmitate, Pyridoxine Hydrochloride, Folic Acid, Potassium Iodide, Sodium Molybdate, Phylloquinone, D-Biotin, Vitamin D3, Cyanocobalamin. The amount of Neocate to take should be determined by a healthcare professional and is dependent on the age, body weight and medical condition of the patient. Neocate® Splash provides complete or supplemental nutritional support for children over 1 year of age. Use under medical supervision. For oral and tube feeding only; not for parenteral use. Shake well before use. If taken orally, Neocate® Splash is best served chilled. Once the drink box is opened, formula can be stored in a refrigerator and kept no longer than 24 hours from the time of opening. Discard formula left in drink box, cup or bottle 1 hour after feeding starts. Do not freeze, boil, or use a microwave to warm Neocate Splash. Store unopened product in a cool, dry place. Once opened, Neocate® Splash should be stored in a refrigerator and kept no longer than 24 hours. Over 150 publications and counting support the use of Neocate for a wide variety of conditions and ages. Of those, there are more than 60 publications on the clinical use of Neocate formulas for the dietary management of cow milk allergy, multiple food allergies and related gastrointestinal and allergic conditions, including eosinophilic esophagitis, short bowel syndrome, and gastroesophageal reflux. There are also many case studies that discuss the successful use of Neocate in these and other conditions, and preclinical studies on Neocate. Duocal® offers ideal support for children who need extra calories that can support vibrant health and catch-up growth. It contains a unique dual energy source of carbohydrate and fat (no protein, vitamins or minerals). 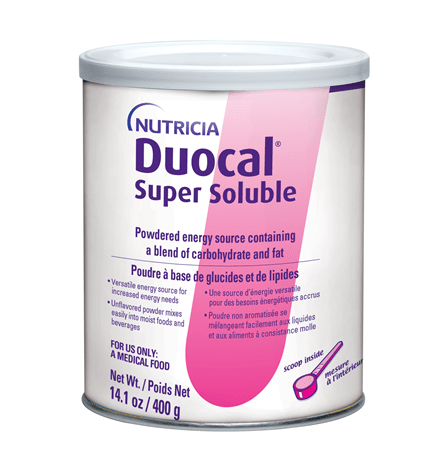 Duocal® is flavorless and is suitable for oral and tube feeding. Duocal is not nutritionally complete. Not suitable for use as a sole source of nutrition. It is to be added to foods or formulas in order to add extra calories into the diet. Not for parenteral use. Duocal® is a specially formulated medical food and should only be used under medical supervision. Duocal® is available to healthcare professionals to sample. Contact your Nutricia sales representative to request samples to be sent free of charge to your practice. Over 20 publications suggest or mention the use of Duocal® products in clinical settings by children and adults with increased energy needs. For patient safety, Nutricia directs parents and caregivers requesting specialized information, such as custom mixing instructions or household measures, to their healthcare teams. A concentrated, powdered vitamin, mineral and trace element preparation designed to help meet the micronutrient requirements of older children (11 years and older) and adults. One 7 g packet supplies the majority of vitamins and minerals needed to meet the DRI of individuals 11 years and older. Phlexy-Vits is specially formulated for the dietary management of conditions with restrictive therapeutic diets. Use under medical supervision. Not suitable for use as a sole source of nutrition. Not for parenteral use. Phlexy-Vits is a specially formulated medical food and should only be used under medical supervision. Calcium Phosphate Dibasic, Magnesium Acetate, Guar Gum, L-Ascorbic Acid, Ferrous Sulfate, Dextrose, Zinc Sulfate, Nicotinamide, DL-Alpha Tocopheryl Acetate, Copper Gluconate, Calcium D-Pantothenate, Manganese Sulfate, Pyridoxine Hydrochloride, Thiamin Mononitrate, Riboflavin, Vitamin A Acetate, Folic Acid, Potassium Iodide, Sodium Molybdate, Sodium Selenite, D-Biotin, Chromium Chloride, Phylloquinone, Vitamin D3, Cyanocobalamin. 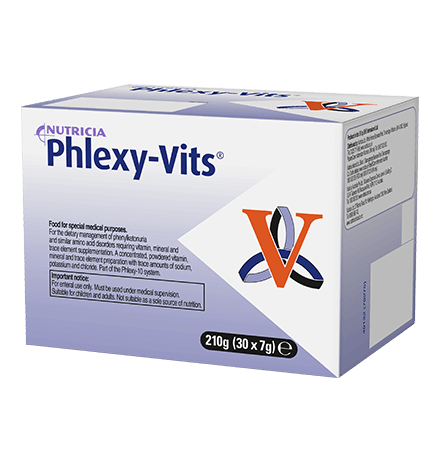 The amount of Phelxy-Vits to take should be determined by a healthcare professional and is dependent on the age, body weight and medical condition of the patient. Phlexy-Vits provides supplemental nutritional support for older children (from approximately 11 years) and adults, and is not intended as the sole source of nutrition. Must only be given under strict medical supervision. For oral and tube feeding only; not for parenteral use. Not recommended for infants and young children. Mix one packet of Phlexy-Vits to a smooth paste with a small amount of water, lemonade, fruit juice or other beverage (approx. 1.5 fl oz or 45 mL). Dilute with additional liquid to a final volume of 5 fl oz (150 mL). The amount of liquid used will vary according to taste. Natural discoloration of this product can occur after reconstitution. For best results, consume immediately. Store in a cool, dry place. Once opened, a packet should be stored in an airtight container and used within 2-3 days. For patient safety, Nutricia directs parents and caregivers requesting specialized information, such as household measures, to their healthcare teams. 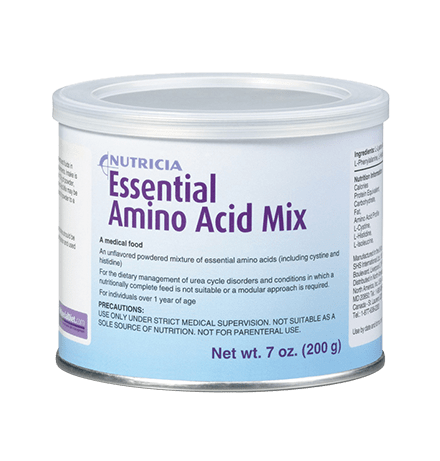 Essential Amino Acid Mix is an unflavored, powdered mixture of essential amino acids, including cystine and histidine. A medical food. Essential Amino Acid Mix is a specially formulated medical food and should only be used under medical supervision. 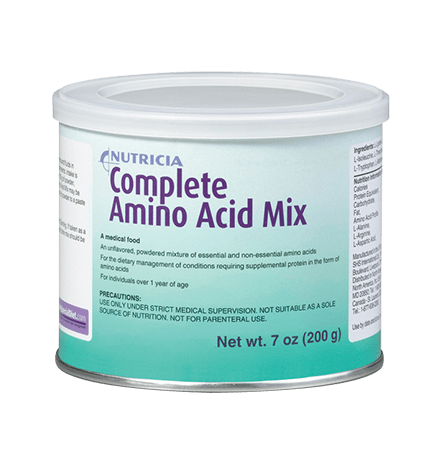 Complete Amino Acid Mix is a specially formulated medical food and should only be used under medical supervision.